I adopted Angel from Purebreds Plus Cat Rescue in Northern California. The rescue is based in Vacaville, and I grew up in Davis, about 20 miles away, so it was easy to fly out and get her while visiting my mom and friends from home. and I drove to Pleasanton, where she was being fostered. Because the resident older female Aby was bullying her (sound familiar? ), Angel was kept in an upstairs bedroom with a charming fawn Aby named Valentino. 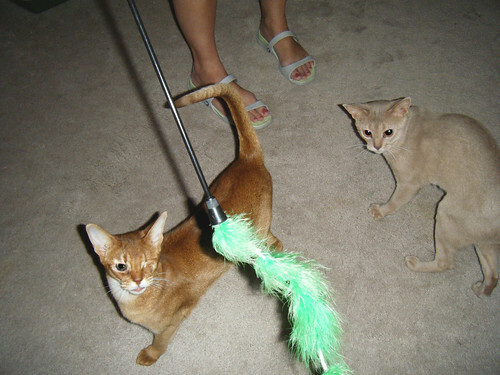 Tino was so outgoing, he monopolised all of our attention and needed to be sequestered in another room so we could interact with Angel. Here are some photos of Angel and Tino in her foster home the day I picked her up. 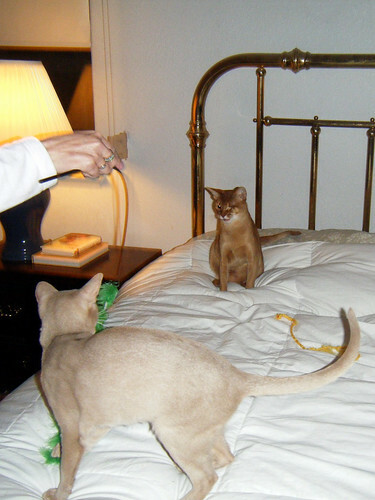 On the bed, playing with a wand toy. You can see how shy Angel was compared to Tino. It was really interesting to see a red/sorrel Aby and a fawn Aby together when I’d only really known ruddy Abys before. The colours are so ethereal.